A Weekend of "White in the Winter Night"
WINTER STORM WARNINGS RAISED FOR MOST OF BALTIMORE-WASHINGTON METRO AREA FROM SATURDAY LATE AFTERNOON THROUGH 6PM SUNDAY FOR 4-8" OR MORE OF SNOW. DC METRO AND NORTHERN VIRGINIA MAY EXCEED 8" IN AREAS WHERE HEAVIEST SNOW OCCURS EARLY SUNDAY MORNING. SHORT RANGE MODELS SHOW INCREASING POTENTIAL FOR A LATE SUNDAY PM SNOW SQUALL TO CROSS THE I-66 CORRIDOR AREA, PRODUCING AN ADDITIONAL 1/2-1"
BESIDES, if you're a Powderhound, isn't this is what we live for, right? Expecting snow and then finding out that your area has been UPGRADED to a WARNING! Golden. SPECIAL NOTE ABOUT THE FORMER INSIDER APP: The Insider App program, operational during the 2015-2017 period is unfortunately no longer available. We do not yet have a projection on if or when this will resume, but are grateful for the generous support and readership many of you devoted to app in those years. SATURDAY: Light snow developing in DC metro area/northern VA between 2-3 PM, in Baltimore metro from 3-4 PM, northern MD/PA line by 5 PM. Intensity will pickup into the evening as the eastward moving energy is transferred to a developing coastal low off North Carolina. SATURDAY PM - SUNDAY AM : Snow intensity region-wide for all areas will increase toward nightfall and continue overnight. This includes a region from the DC I-66 corridor north to the PA I-76 turnpike and east to the Chesapeake Bay & the Eastern shore of MD/DE. Up to 3" is probable by daybreak Sunday for these areas. Sunday AM activities including worship services likely to be impacted. Areas south of I-70 may receive 4" or more where heavier bands develop. 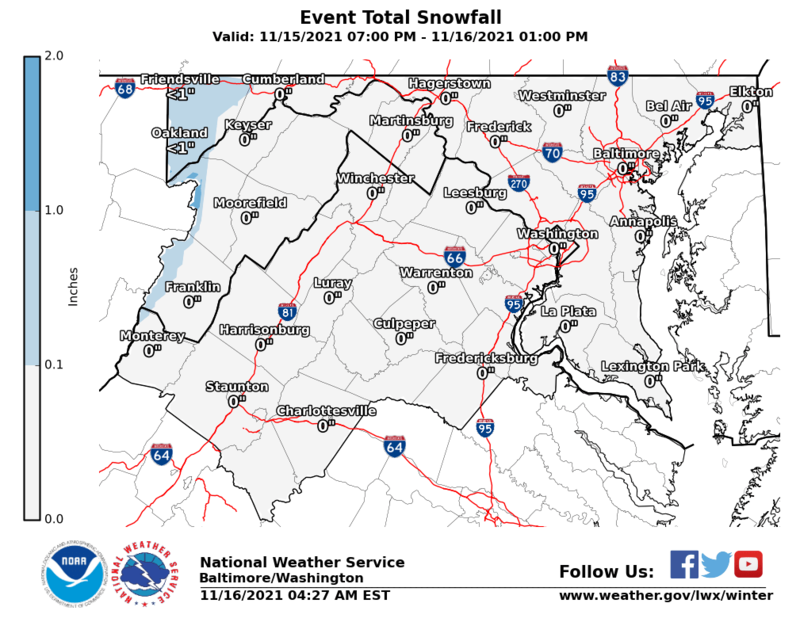 SUNDAY PM - MONDAY AM : Snow begins tapering south to north, ending in DC metro by Sunday noon, Baltimore metro region in mid afternoon,and southern PA/Eastern shore by sundown. With sub 30 F temperatures overnight Sunday and powdery snow composition refreezing on untreated surfaces, it is likely that travel delays and some disruptions will occur for the Monday AM commute. For schools, if a second round of snow occurs after grounds crews have cleared lots and prepared buses, Monday may be a challenging situation depending on one's location. LET'S SEE WHERE THIS THING GOES... Short range computer models guidance continues to indicate that higher totals are possible, due either to moisture enhancement from the eventual coastal system, higher snowfall ratios due to cold air, or a northern creep of higher moisture levels. Any of these would result in surprise increases of 1-2" in snowfall totals in the final 6 hours of this event. 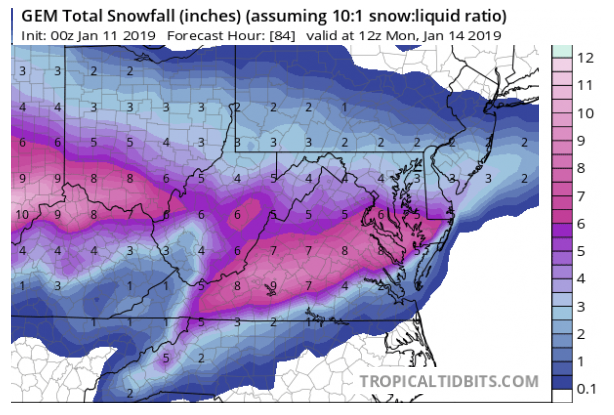 (We think) "...it's meant to be..."
Accumulating snow up to 4" likely between central Virginia and the PA turnpike, including the DC & Baltimore Metro regions, with potential for 5" or more. Snow-to-liquid ratios above the normal10:1 may develop in areas with sub-30 F temperatures during the event, due to strong high pressure in southeast Canada prodviding a continous supply of Arctic air into the system. for the period Sunday 1/13 into Monday 1/14. This map indicates a 30-50% chance of liquid equivalent precipitation in Snow or Sleet may exceed 0.25"
5:15 AM ET 1/9/19 - Those who experienced the President's Weekend Blizzard of 2003 may have vivid memories of just how cold the temperatures fell during the heaviest snow periods of that event. In Southeast Baltimore County, at FF HQ, we recorded a high of 18 F on that fateful Sunday, amid the pouring powder. With a snow-to-liquid ratio that exceeded 15:1 at times, and 1.5 inches of liquid, it is easy to see why that system delivered a 24" punch to the region. Seriously? This'll be like Feb 2003? Actually, that's not expected this time. However, the "near-exact replica" map comparison above gives us great pause to consider just how similar the two events look across time. It is a lesson to never underestimate how cold air can enhance your snowfall beyond what you thought would be possible. So in the words of Florida Georgia Line's great country single, let's see where this thing goes, because if it's meant to be, it'll be. Let us know in the comments if you recall how that ride went back in '03 or where you see this going by the weekend. By 11 AM Sat: Light snow has overspread the region from DC / I-66 corridor north to PA line. Some sleet may mix in Saturday afternoon. By 5 AM Sun: Moderate to heavy snow develops, continuing into daybreak, and the midday hours. By 5 PM Sun: Majority of accumulating snow has ended south and west of Philadelphia (including Baltimore & DC region), tapering to flurries by midnight. For areas south of I-70 to DC metro region, up to 0.75" of liquid is projected. If you multiply the 0.75 by a snowfall ratio of roughly 12:1 due to cold air enhancement, this indicates a ballpark idea on totals by 5 PM Sunday. Striking similarities exist between projected dynamics of this system and the February 2003 President's Weekend blizzard. That year, even 4 days in advance, virtually no public forecasts had an indication the region would receive a 24"+ event. 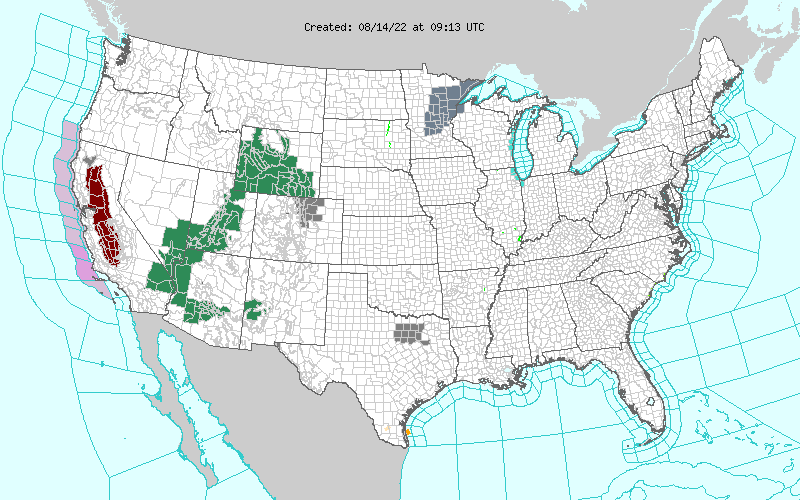 However, it should be noted moisture levels of the current system are to be approx. 0.5 - 0.75" vs. the 1.5" liquid which fell in 2003. With a strong 1040 mb+ high to position in SE Canada juxtaposed by a developing Low in the southeast moving to the Outer Banks by Sunday morning, it is not unreasonable to consider that snowfall forecasts may exceed current estimates given higher-than-usual snowfall ratios of 12: to 15:1 are possible from this cold air. One aspect of the storm we are confident in, is the high confidence in that snow will fall and accumulate. In this case, not all lyrics from this song of "Maybe we will, maybe we won't, maybe we do, maybe we don't" apply to the scenario at hand. It's a rare moment in forecasting, but this time we are pretty sure the "will" part of the song is going to be represented well in the storm. Hope this pans out! Would hate for this storm to miss us to the south like the last one. Fingers are crossed! I love it when you all are online and talking to me about the weather. I remember 2003, I loved it!!!! I love snow! I am hoping this will be a snow event. It's been a long time coming and I am almost ready...need a few items from the grocery store and then I am all set!!! Yippeeeeeee! Well, I am in Winchester, VA. I grew up in Ocean City before spending 10 years in Reisterstown. I caught all 3 storms, President's Day at the beach, Snowmageddon in Reisterstown, and my first winter in the mountains outside Winchester 3 years ago caught the 43" mega storm that January. Haven't had more than a foot to 15" in any storm since. Would be nice to get a boost in moisture and cold air. Hearing up to 9" here. So excited! And welcome back everyone! DON'T TEESE! 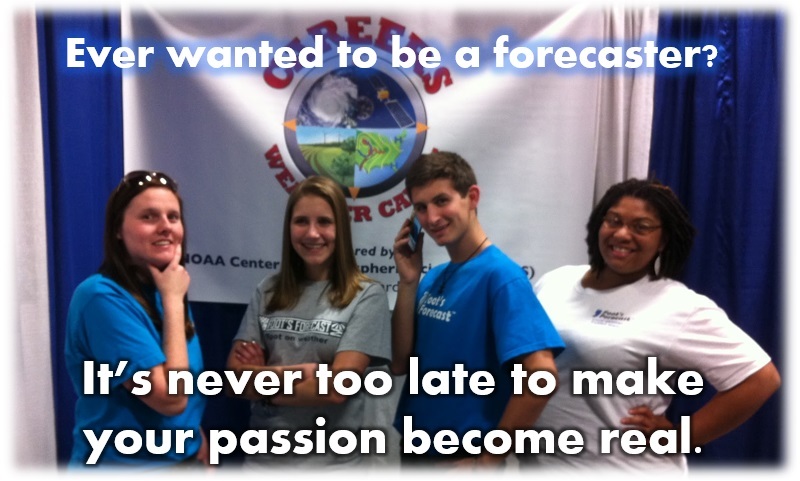 WE WANT A BIGGLY SNOW STORM (LOL)! It’s Show Time. We are driving to Cambridge, MD for a 5pm event today. Spending the night on Hoopers Island then have to be in Annapolis tomato at 1pm. I’m bringing the shovel and Whellys with us. Going straight into it and trying out the new Subaru Outback. Wish us luck. Welcome back to all seasoned and newbie Powderhounds. Well, so you heard about next weekend hmm? Let's just say we think many outlets will stay quiet about it for a while until after this one is done. Then they'll take another look and say, "Surely you can't be serious." Mr. Foot's, so glad you're back to give guidance to all of us snow freaks. Thank you and more snow to you. White knuckle driving out there but trucks are out. Came back to West Baltimore from the Eastern Shore. Snowing hard the whole way. Wx channel is now saying the low forming off the coast could build moisture then push the storm back into our area for round two starting around 11 am Sunday. Foot's does that sound possible? Hi Everyone. I hope your enjoying the powder outside. It’s 7:15am Sunday and it looks like we have about 5 inches here in West Baltimore. I’m about to suit up and start the shoveling. What’s cooking where you are? Northeast B'more city about 5 inches. Kids are super happy and so is Mom.